Pastor Laura has been blessed to serve as the pastor of Buxton Centre Baptist Church since September 1, 2010. She has previously served churches in Portland, Biddeford, and Saco, Maine, as well as a Christian community center for at-risk youth and families. She has a BA in Religion from Bates College and a Masters of Divinity from Andover Newton Theological School. Pastor Laura loves preaching, and one of her favorite times of the week is the time she spends studying Scripture and preparing to share God's Word. She also loves socializing with the "Souper Seniors" every Monday and having fun with the children and teens, especially during Vacation Bible School. 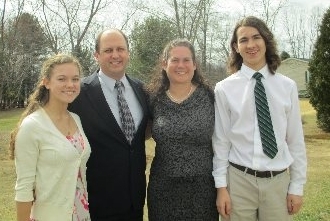 Laura's husband, John Haslam, also an ordained minister, works as the Associate Pastor of Portland Christian church, serving the Stroudwater Baptist campus. Their daughter, Alanna, attends Bowdoin College, and son, Sam, is a student at Thornton Academy. The other members of their household include Chrissy the cat, Bella the dog, and Max the Miniature Horse.